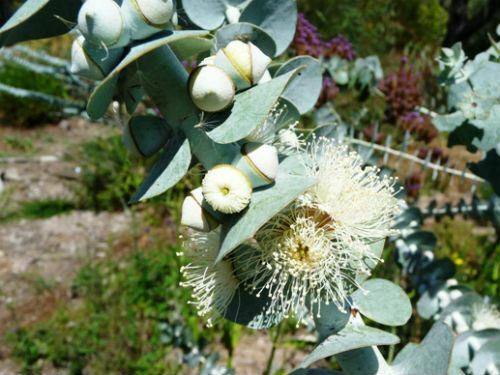 Eucalyptus pulverulenta is known as the Silver-leaved Mountain Gum and develops into a tall shrub or small tree. In cultivation the species is usually seen as a tall, spreading shrub. The Silver-leaved Mountain Gum is an unusual Eucalypt (especially for eastern Australia) because it retains juvenile foliage into maturity. Plants rarely produce adult leaves. Leaves, young stems and inflorescences have a powdery white bloom. This is the meaning of the species name. The juvenile leaves are silvery-grey, round and opposite (see image). Cream flowers are carried in clusters of three in the upper leaf axils. Flowering occurs between May and November. Large fruits are cup-shaped and often retain the powdery bloom. Eucalyptus pulverulenta is a rare plant with restricted distribution. There are two small populations. One in the Blue Mountains, west of Sydney and the other is in the Southern Tablelands. In the past the species distribution may have been more widespread with populations occurring between the north and south occurrences. There may even be populations hidden in the wild country of the Blue Mountains National Park and the Warragamba Dam Catchment Area. The Silver-leaved Mountain Gum is widely grown in California as an ornamental. In Australia the species is cultivated as a cut foliage plant. Eucalyptus pulverulenta responds enthusiastically to hard pruning. Eucalyptus pulverulenta is a striking plant and could be grown as a “stand alone” specimen in the larger suburban garden or rural property. Propagate from seed. One reference also mentions propagation from cuttings. Something we will have to try. The plant photographed is a cultivar known as “Baby Blue” growing in our garden. This is a dwarf form. Our plant after about four years in the ground is three metres tall and a similar width. The specimen flowered profusely three years after planting.